This article was #16 of the Top 25 most well-read articles on www.progressivedairy.com in 2013. It was published in the January 21, 2013 print issue. Click here for the full list of the Top 25. Debunking the myth that sand bedding cannot be used on a farm with an anaerobic digester, we profiled the digester system (including sand separation equipment) at Central Sands Dairy. While the farm is keeping 99 percent of sand from the entering the digester, Adam Onan, a manager at the dairy, said one downside is getting the separated sand dry. Q. You mentioned struggling with wet sand in cold weather. With winter upon us, have you made any changes to the system to remedy this problem? Myth: Sand cannot be used for bedding on a farm with an anaerobic digester. Fact: Sand separation technologies allow farms to bed with sand and digest the manure. Central Sands Dairy in Nekoosa, Wisconsin, is a prime example. 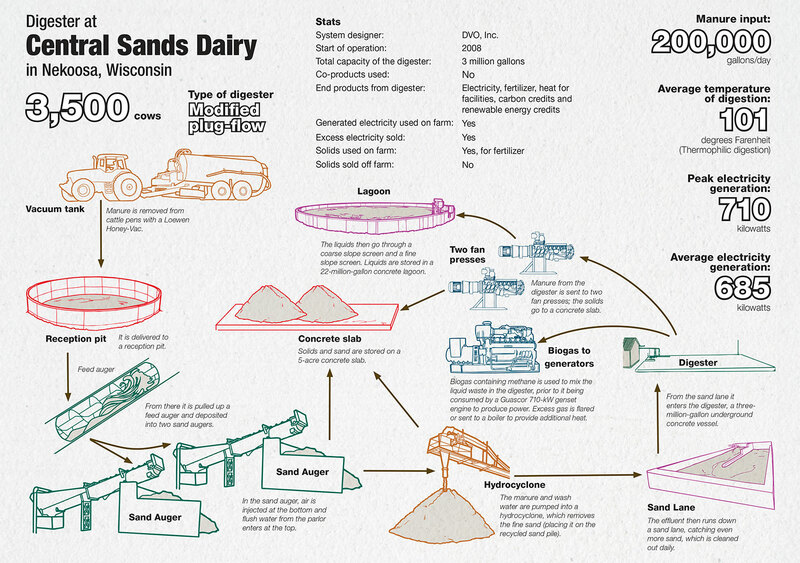 The owners and operators of Central Sands Dairy are big believers in sand for bedding. 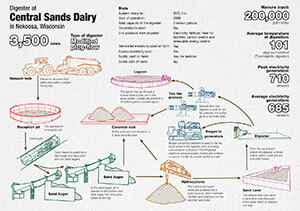 According to Adam Onan, a manager at the dairy, the sand yields clean, comfortable cows. Plus, it is abundant in the central sands area of Wisconsin. Nearby cranberry growers regularly dig up the sand when building a new bed for their crop. The piles then provide an ample supply for the dairy. The use of sand on the dairy wasn’t negotiable and therefore, when it wanted to install a digester, the farm needed to find a way to remove sand from the manure. The sand recovery system uses water from the parlor to wash the sand-laden manure. Because too much water can affect methane production in the digester, Onan says the farm monitors how much is used in the sand system. “There’s 5 to 6 percent solids entering the digester, and we’d like it to be a little higher,” he says. The system does remove 99 percent of the sand from the manure, even capturing the very fine sand particles . Click here or on the image at right to view it at full size in a new window. Since installation in 2008, Onan says the digester has only had to be cleaned out once, which was the result of an experiment with adding corn silage as opposed to sand build-up. Of the 1 percent of sand that does enter the digester, almost all of it stays in suspension and exits with the manure. The downside, Onan says, is that it takes a bit of work to get the sand dry. After it is separated, the sand is piled and left to sit for a couple of weeks to allow the piles to drain. This process doesn’t work well in winter, and fresh sand is brought in through the colder months. For this reason, the farm is considering moving the sand with an elevator to keep it high and dry in the winter. It is also looking to add dewatering screens to the separation system. A vibrating motion on the screens shakes water particles from the sand prior to it being piled for reuse. Sand-free manure is digested and then separated. The farm has eight miles of pipe to transfer the liquid effluent to center irrigation pivots. This works well for emptying the top two-thirds of the lagoon. The bottom third of the liquid is emptied through a dragline system and injected into the fields. Separated solids are also applied to the fields as fertilizer. Methane from the digester powers a 710-kilowatt engine. The dairy pulls its electricity first, averaging a need of 350 kilowatts per hour. Less than that is consumed in the winter, but almost double is needed in the heat of the summer for cow cooling systems. The remaining electricity is sold back to the grid. Onan adds that the farm is looking at ways to remove the hydrogen sulfide from the methane so there are fewer problems with the engine.